All ACs are rated in watts, but they do not consume the same all the time. Most 1.5 Ton ACs are rated for about 1.5 kW to 2 kW. But their consumption varies in different settings. The job of an AC is to remove heat and humidity from and enclosed space and it will consume just that much amount of electricity that is required to do so (plus or minus delta based on AC sizing). Which means a 1.5 ton AC if put in a 120 sq ft room will consume different amount of electricity in one hour than a similar AC put in 150 sq ft room in the same location (and in similar conditions). This is because heat will be more in 150 sq ft room and thus it will take extra electricity to remove it. Some cities are hot; some are humid and some cold. An air conditioner does 2 things: cool the air and remove the humidity. If a city is hot, most of the electricity is consumed to bring down the temperature. But some cities are humid but not very hot (costal regions) and because the switching of the compressor depends on temperature. So a 1.5-ton AC in a similar setup in 2 cities will consume different amount of electricity because the temperatures are different. The consumption will be less in the city with lower temperature. This also brings up a point that the tonnage of AC required for a room varies across cities. A city that is more humid does not require much cooling but needs more of humidity removal. Humidity removal depends on the time for which compressor runs. If the AC is oversized, compressor will run in short cycles and thus will not be able to remove humidity effectively. Thus it makes sense to buy smaller ACs for a humid place. On the whole sizing of air conditioner is important. 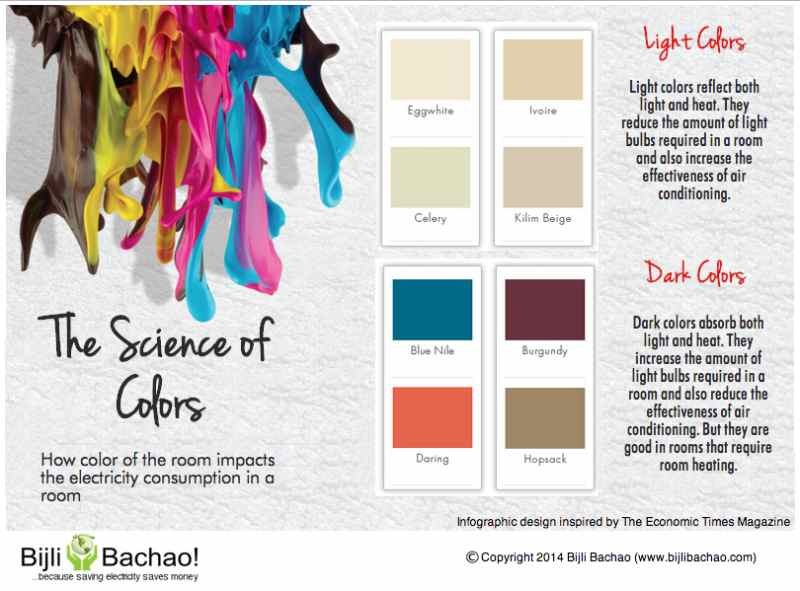 From colors in the room, we don’t just mean the color of the walls. All dark colors absorb heat. So if your curtains are dark, they do not help. If your walls are dark they absorb heat. Even if you the cloths you are wearing in the room are dark, they absorb heat and will take more time to cool. If everyone in the room is wearing dark jeans! it means your AC is working harder. Most of these things are unavoidable, but some of it might help if you are aware of it. Recently a friend called us up regarding electricity bills in his coaching classes. On evaluation we realized that he had 2×2 ton ACs in a small room of 150 sq. ft. and both had to be kept on when the classes were on. A class full of 40 kids had so much heat that it needed so much cooling. Human body emits heat based on its metabolic rate. Thus more the number of people, more is the heat in a room and thus more cooling is required. This if more people are expected in a room, more tonnage is required to cool the room. We often observe that our laptops or computers become after long operation. Even mobile phones behave the same way. All electronic and electrical appliances emit heat that will be cooled if Air Conditioner is turned on. Even bulbs and lights emit heat along with light (more on it on our article: LED light bulbs buying guide). Thus if you put a lot of lights in a room, the room will need more air conditioning. Thus using lesser lights will have double benefit. A warehouse full of material typically needs a lot of air conditioning, because every object kept in the space needs cooling. Every solid object is a conductor of heat and thus more the number of things in a space, more is the cooling required. Keeping a room organized thus makes much more sense not just for aesthetic beauty of a room, but also for air conditioner’s electricity consumption. Keeping things in closed almirahs can thus reduce some electricity used by an air conditioner. The walls also absorb heat and thus insulation of walls is important. In our article on Ideal Air Conditioner temperature for electricity savings we wrote that the electricity consumption of air conditioners depends on the thermostat temperature. The lower you keep the air conditioner temperature; higher will be the electricity consumption. In point 1 we talked about size of the room impacts electricity consumption. It essentially means that the space to be cooled is more in a bigger room that needs more electricity to be cooled. In a previous article: Increase Air Conditioner effectiveness and save electricity by closing doors and windows, we pointed out how if the doors and windows are not closed, the space to be cooled increases. Thus it is important to close the room completely in order to optimize the space to be cooled. It also means that the doors of the almirahs, etc. in the room should be closed when air conditioner is switched on. Open almirah door not only add space to be cooled but also add to the number of objects in a room to be cooled. All these factors impact the load on air conditioner and can not only impact your electricity bill, but can also impact your capital cost of buying an air conditioner. If optimized well even a small sized AC can cool the room effectively.